"Against All Enemies" will be released in June. Peter Telep isn’t your average English professor. By day, Telep teaches screenwriting, creative writing and fiction writing at the University of Central Florida. By night, he’s a New York Times best-selling author and the most recent collaborator of Tom Clancy, the renowned author of international thrillers. 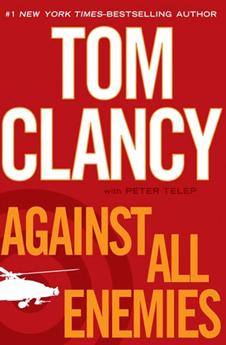 He co-authored Clancy’s newest book “Against All Enemies,” to be released in June. On his own, Telep has written nearly 40 books that span the genres of science fiction, fantasy, military adventure and video games. He also has written scripts for film and television. Before coming to UCF, Telep attended Southampton College in New York. He left school to pursue screenwriting and later enrolled at UCF, where he completed his undergraduate and graduate degrees in English. Recently, UCF’s news office had a chance to sit down with Telep to learn about the new book, what it was like working with Tom Clancy and what he enjoys about UCF. How did you discover that you wanted to write books? I was a big fan of the original “Planet of the Apes” movies. My third-grade teacher took one of my pieces of writing that was a “Planet of the Apes” adventure, and she made it into a book and put it on the bookshelf so the other kids could read it. That image resonated with me. How did you end up teaching at UCF? I love UCF — I’m an alum. Many of my colleagues are my former teachers, and they are very supportive and encouraging. The students are diverse, challenging and exciting. Teaching is so rewarding, and it’s the perfect complement to being a writer. I knew while I was attending UCF that I wanted to work here. How did you get the opportunity to write with Tom Clancy? What was that like? We have the same publisher and editor. I was asked by the publisher and Clancy’s people, and what do you say? It was a terrific opportunity. Everything was done through e-mail and phone because Tom lives up in Maryland. The creative process starts out with a big concept, and that’s made into an outline. We did write a very extensive outline for this book. I think it was 15,000 or 20,000 words or 30 or 40 pages of outline material. After a number of drafts, we were in agreement with what the book was going to be about. Between Tom’s resources and my own, we were able to get a lot of the research done very quickly. It was a very smooth process. It was sort of a master and apprentice relationship, where I was able to learn the way Tom works. We were very happy with the way things turned out. The main character is a former Navy SEAL and CIA agent named Maxwell Steven Moore. He’s more flawed than typical characters. He has got a darker past, and I think that’s good because tragic heroes are more accessible to a contemporary audience. He’s still a military hero, but he has made some very significant mistakes. It’s fascinating to follow him around and see if he ever gets past that baggage. There is a lot of reciprocity. I’m writing because I do what I teach. If you can be an expert in your field and communicate that to students then it’s the best of both words. I love to talk about what’s going on in my own work. I think the students see the day-to-day struggle of being a writer through my eyes, because I talk about my own challenges, and they can relate to them. They are sitting at home trying to write something, and they face the same problems I face. I would like to write another book in this series that Tom and I have created. Other than that, I have a dozens of ideas for other screenplays and books. I’ve never written about police or detective work, so I’d like to write a murder mystery thriller with a ‘noir’ edge.